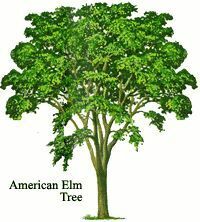 Throughout the 20th century, the beautiful elm tree could be seen lining most American and Canadian residential neighborhoods. Its high canopied crown provided great shade. Also, its quick growth and longevity made it the ideal accent tree. So let’s take a look at The Majestic Elm: A Brief History. The history of the elm tree stretches back to ancient Europe. In the ‘old country’, people used elm leaves and branches as cattle feed. Some even used it as human food in times of great scarcity. In addition, the ancient Romans used elm trees to sustain grapevines — as a make-shift grape arbor. Also, Native Americans utilized this durable and water-resistant wood to fashion canoes, rope, utensils and roofing. A fungal infection known as Dutch elm disease (DED) has placed the American elm’s graceful form under attack during the 20th century. However, while DED ravaged the elm population, its spread had lessened in recent years. So this has resulted in a renewed appreciation and use of the American elm in furniture craftsmanship and industrial supply. To see authentic, hand-crafted American Elm furniture, check out Brandenberry Amish Furniture and see for yourself what makes this beautiful wood one-of-a-kind.